Introduce the Fundability Worksheet from Medicoventures. Identify an existing health care issue. Report on the impact of the issue on society (why it’s important). Identify your customers for validation. Cite appropriately all resources used in completing this analysis. 1. Describe the health care issue you will develop a solution for. Include a description of the pathology your device or technology that will treat/prevent/diagnose. 2. Customer Validation: Create a list of 20 specific customers that you would contact to validate your device/technology (physicians, individuals, organizations etc). 4. IP Position: Perform a patent search and describe existing patents related to your device/technology. 5. 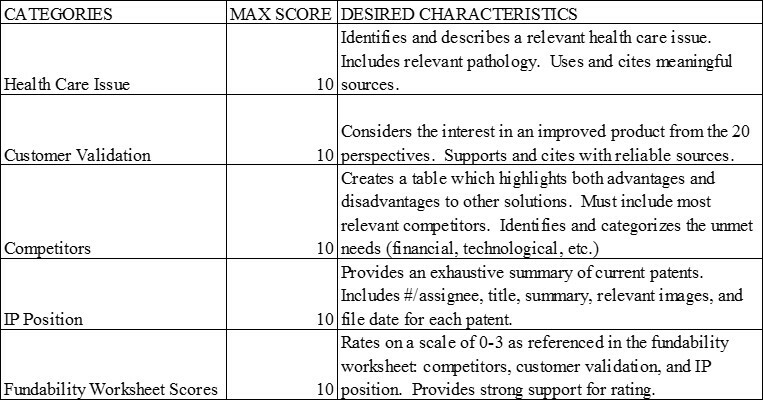 Using the information you have compiled, score the above portions of the fundability worksheet. This page was last edited on 17 January 2017, at 15:25.